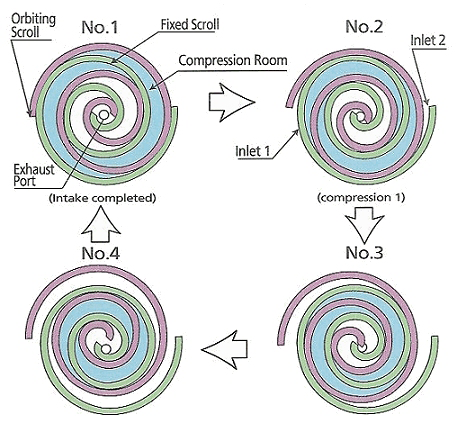 A scroll compressor is a positive displacement compressor which uses 2 concentric spirals interlocking with each other. These two spirals move in orbital motion in such a way that they push can push the fluid between them in a smooth way, compressing that fluid along the way. Such scroll compressors have fewer moving parts, are more reliable and make less noise. Hence they are preferred in to be used in HVAC systems. HVAC is short for "Heating, Ventilation and Air Conditioning" systems. Generally, the goal of an HVAC system is to maintain indoor temperature in residential, commercial or industrial buildings and to maintain a certain level of air quality indoors. This usually involves either heating or cooling the indoor through a heating or cooling unit and then recirculating it through the building. Normally a compressor is used in the 'Air Conditioning' process of an HVAC system. Air conditioning involves a refrigeration cycle. Here, a refrigerant is first compressed and then throttled across an expansion valve to suddenly reduce the pressure. This sudden drop in pressure causes the temperature of the refrigerant gas to drop because of the Joule Thompson effect. Air conditioning is meant to provide 'thermal comfort' using temperature control. Hence it is important to use reliable equipment in air conditioning that is also easy to maintain. Because of their structure, scroll compressors operate by using few moving parts. That makes them easy to maintain. Also, because of their structure, scroll compressors see minimal torque variation. Hence they make much less noise compared to reciprocating compressors. They are also smoother and more efficient than reciprocating compressors. For all these reasons, they are easily the preferred choice of compressors to be used in air conditioning and HVAC systems. This is more detailed article about the structure, advantages / disadvantages of scroll compressors and how they work.